When the POWER5 processor was released in 2004 it was made in two versions, a DCM (Dual Chip Module) containing a POWER5 die and its 36MB L3 cache die, as well as a MCM containing 4 POWER5 die and 4 L3 cache dies totaling 144MB. The POWER5 is a dual core processor, thus the DCM was a dual core, and the MCM an 8 core processor. The POWER5 contains 276 million transistors and was made on a 130nm CMOS9S process. In 2005 IBM shrank the POWER5 onto a 90nm CMOS10S manufacturing process resulting in the POWER5+. This allowed speeds to increase to 2.3GHz from the previous max of 1.9GHz. The main benefit from the process shrink was less power draw, and thus less heat. 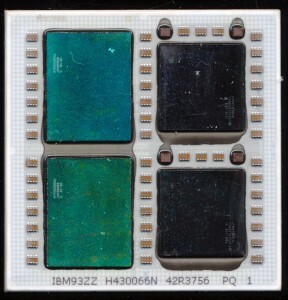 This allowed IBM to make the POWER5+ in a QCM (Quad Chip Module) as well as the previous form factors. The QCM ran at up to 1.8GHz and contained a pair of POWER5+ dies and 72MB of L3 Cache. The POWER5+ was more then a die shrink, IBM reworked much of the POWER5 to improve performance, adding new floating point instructions, doubling the TLB size, improved SMP support, and an enhanced memory controller to mention just a few. The result? A much improved processor and a very fine looking QCM. 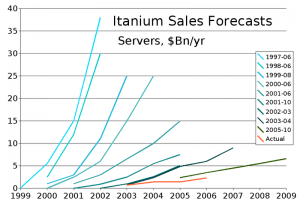 ‘Itanium is dead’ is a phrase that has been used for over a decade, in fact many claimed that the Itanium experiment was dead before it even launched in 2001. The last hold-out of the Itanium architecture was HP, likely because the Itanium had a lot in common with its own PA-RISC. However HP has announced that they will be transitioning their NonStop sever series to x86, presumably the new 15-core Xeons Intel is developing. Itanium was launched with goal of storming the server market, billed as the next greatest thing, it failed to make the inroads expected, largely due to the 2 decades of x86 code it didnt support, and poor initial compiler support. Many things were learned from Itanium so though it will become but a footnote, its technology will live on. Interestingly other architectures that seemed to be n the brink are getting continued support in new chips. Imagination, known for their graphics IP, purchased MIPS, and now has announced the MIPS Warrior P-class core. This core supports speeds of over 2GHz, and is the first MIPS core with 128 bit SIMD support. Broadcom, historically a MIPS powerhouse, has announced a 64-bit ARM server class processor with speeds of up to 3GHz. Perhaps ironic that ARM is now being introduced into a market that Itanium was designed for. Broadcom has an ARM Architecture license, meaning they can roll their own designs that implement the ARM instruction set, similar to Qualcomm and several others. POWER continues to show its remarkable flexibility. Used by IBM in larger mainframes in the POWER7 and POWER8 implementations it crunches data at speeds up to 4.4GHz. On the other end of the spectrum, Freescale (formerly Motorola, one of the developers of the POWER architecture) has announced the 1.8GHz quad-core QorIQ T2080 for control applications such as networking, and other embedded use. These days the POWER architecture is not often talked about, at least in the embedded market, but it continues to soldier on and be widely used. LSI has used it in their Fusion-MPT RAID controllers, Xilinx continues to offer it embedded in FPGAs and BAE continues to offer it in the form of the RAD750 for space-based applications. Perhaps it is this flexibility of use that has continued to allow architectures to be used. 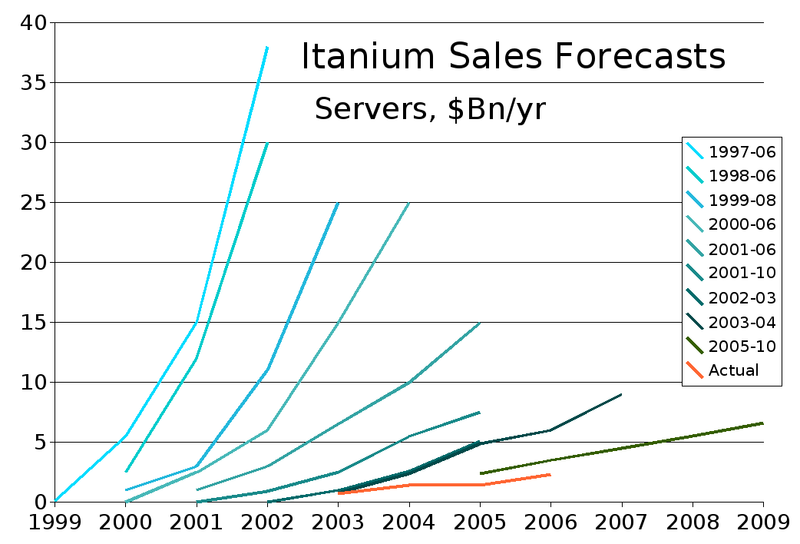 Itanium was very focused, and did its one job very well. Same goes for the Alpha architecture, and the Intel i860, all of which are now discontinued. ARM, MIPS, POWER, x86 and a host of MCU architectures continue to be used because of their flexibility and large code bases. So what architecture will be next to fall? And will a truly new architecture be introduced that has the power and flexibility to stick around?